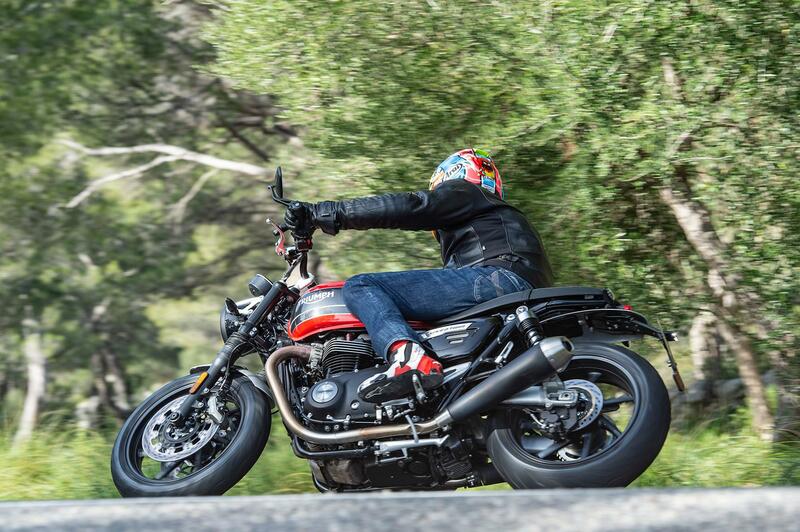 Triumph’s new Speed Twin is more than just a comfier Thruxton. Taking the best bits from the raciest of their retros and laid back roadsters it’s fast, fun, all-day comfy, easy to manage and despite its modest suspension and braking hardware, has the ride quality, poise and stopping power of a Street or Speed Triple. 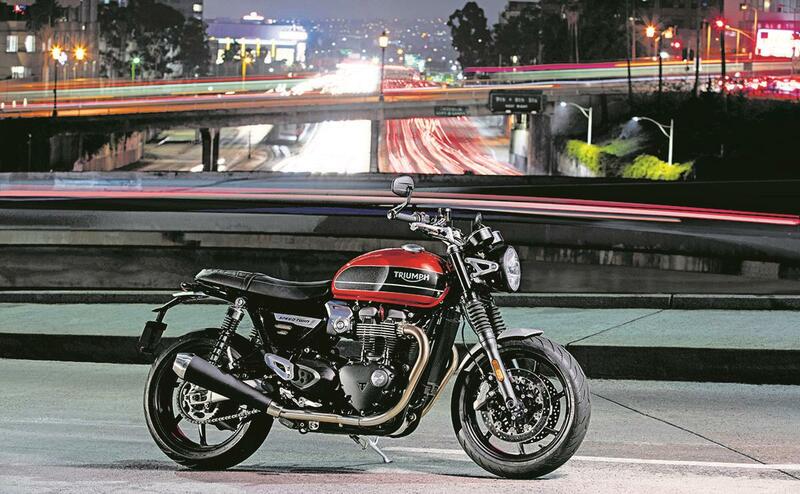 The throttle response isn’t as polished as many Triumphs and some may still want the ability to fine-tune their suspension, but the Speed Twin is a classy, affordable slab of retro that its rivals will struggle to keep in their sights. Sustained hours in the saddle won't bother your joints. 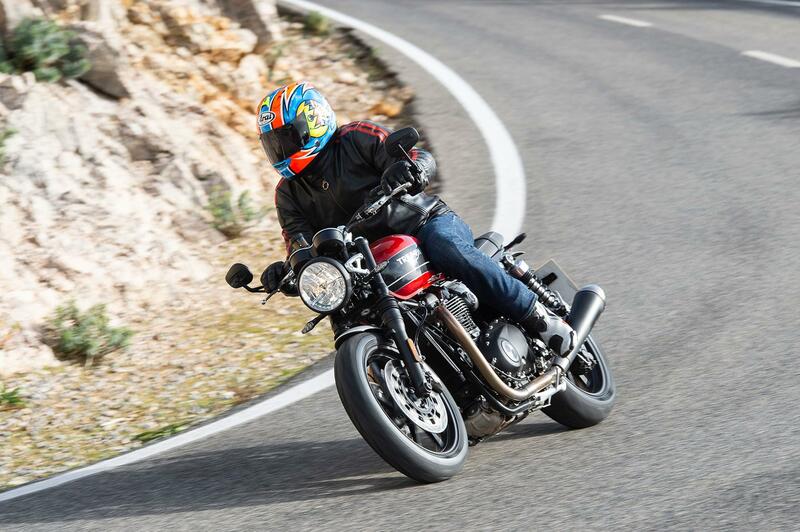 Pegs are 4mm lower and 38mm further forward than the Thruxton's, seat height is lower (just 807mm), despite having 10mm more padding and the tapered bars have more than a hint of ready-for-action Speed Triple about them. Twinges of derrière discomfort eventually creep in after around six hours in the saddle - about five hours better than the torturous Thruxton's. Aside from a new subframe, aluminium down tubes and the odd bracket, the Speed Twin’s frame is the same as the Thruxton's. 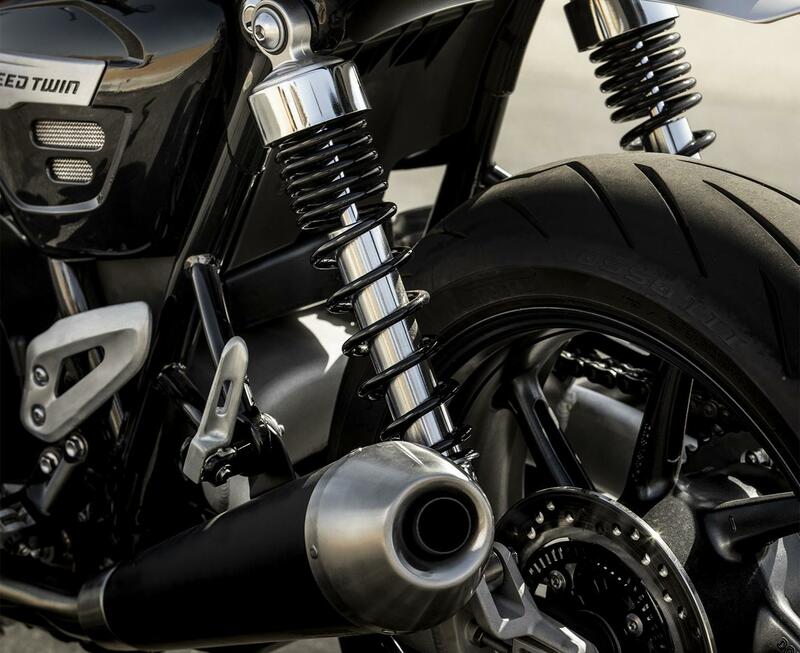 Suspension is by KYB: non-adjustable forks up front and preload-adjustable twin shocks at the rear. Don't worry about the lack of twiddlers because the chassis set-up is Triumph at its glorious best. 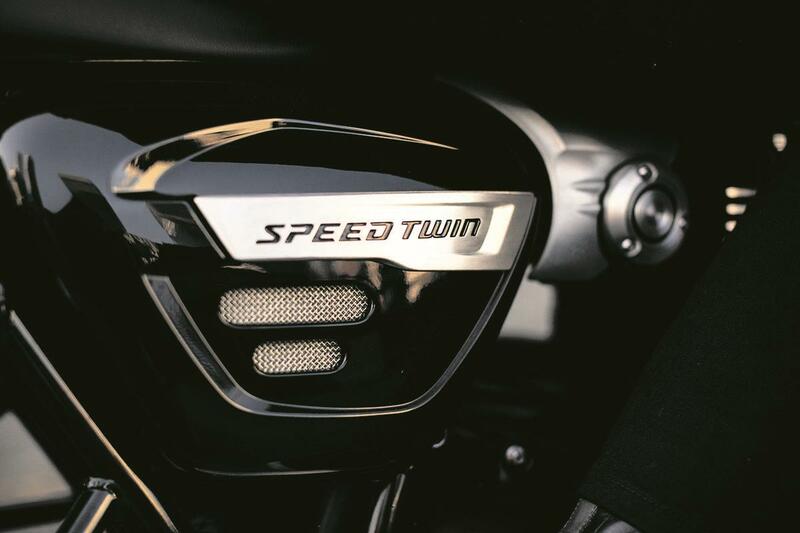 Perfectly balanced and with sumptuous ride quality, the Speed Twin rolls through corners with a twinkle in its eye and slightly lazy steering geometry makes fast corners its party piece. Slowing down the fork dive on the brakes with a dab of compression damping would be nice (if we’re being fussy), but the suspension will be bang-on for most riders and styles. Lightweight seven spoke wheels contribute to the Speed Twin's breezy agility and Pirelli Diablo Rosso III tyres (the good ones, not cheap spec OEs) dig in hard once they’re up to temperature. 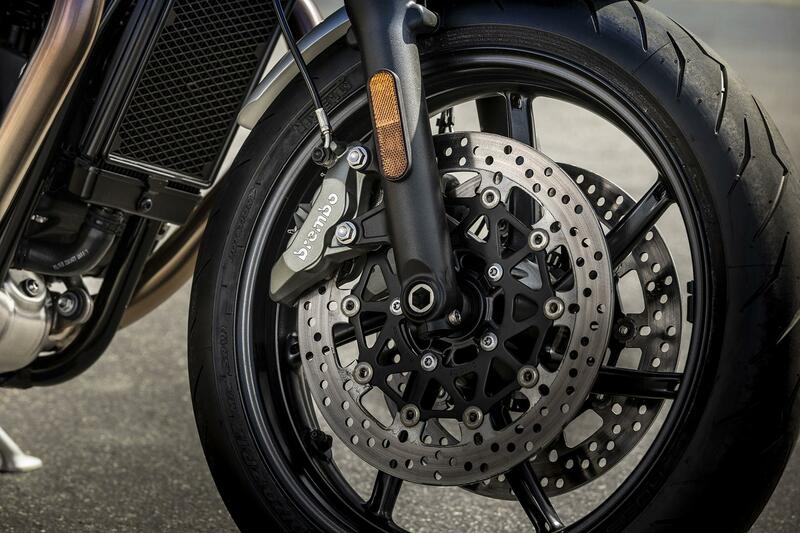 Four piston, four-pad Brembos may not be radial, but who cares when they ooze this much power and feel? 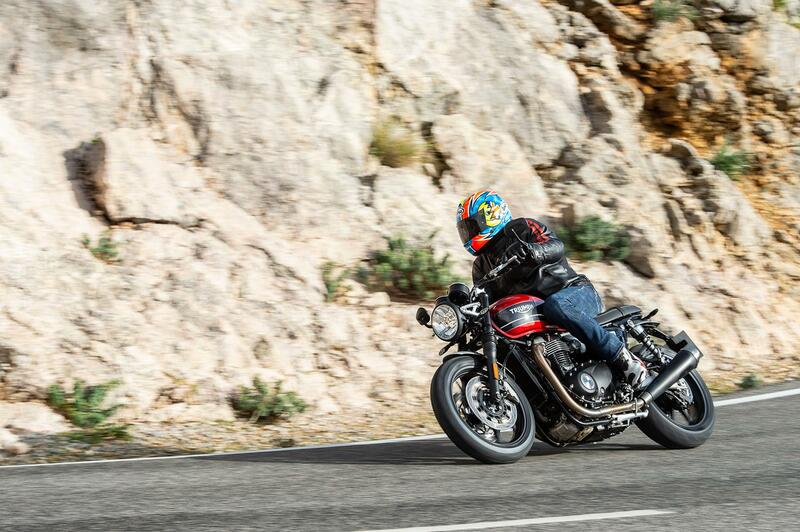 Triumph’s Chief Product Officer, Steve Sargent explains why they put the Thruxton on a 10kg diet to create the Speed Twin. "We started with the engine to see what inertia we could get out of it and one of the biggest opportunities was the clutch. The Speed Twin has a different clutch basket and lighter, more heavily machined gear, which saves about a kilo," he explained. "On the front end of the bike the combined wheel and disc assembly is about 2.9 kilos lighter and we replaced the frame’s steel cradle with aluminium – a first for any Bonneville model. We’ve taken another 1.6 kilos out of the rear wheel, as well. "Reducing inertia benefits the handling the most. The more weight you've got in anything that's spinning fast is going to make it harder to change direction. That reduction in inertia liberated quite a lot out of the chassis, in terms of how quickly the bike turns-in and how precise it is. "We actually ended up lengthening the wheelbase over the Thruxton and if we hadn't done that it actually starts to get a little bit too flighty. On the rake we're 0.1 degrees further out, there's more trail and a 15mm longer wheelbase [thanks to a longer chain]. "Overall, the weight bias is slightly more towards the front end of the bike now, so it's gone from a 48% front-end bias to a 50%. We've got the same suspension spring rates as the Thruxton with less rear preload and higher oil level on the front, for slightly different air damping in the forks. "We had to make those changes to the chassis to get the stability back after reducing weight and inertia." A reworked 'High Power' 1200cc parallel twin-cylinder Thruxton lump provides the Speed Twin's beating heart and darkly gruff soundtrack. The motor alone is 2.5kg lighter, thanks to its revised clutch assembly and new engine covers. It even has a magnesium cam cover, like a Ducati Superleggera. Making 96bhp to the crank, the Speed Twin delivers supersport punch when you dial in the revs, but there's so much grunt, delivered from almost tickover, it’s more rewarding to use lazy gears in the corners and surf the Triumph’s great wave of torque on the way out. Triumph are masters of ironing out the glitches from their ride-by-wire throttles, but the Speed Twin's fuelling is a little abrupt on and off the throttle at low speed, but once you're rolling (or in Rain mode) the throttle becomes nicely damped. 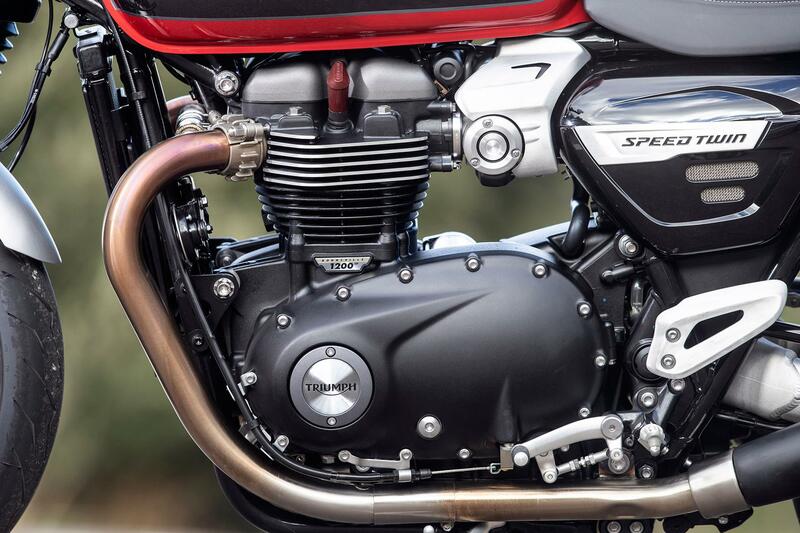 A quick glance at the Owners’ Reviews section in our Thruxton report, tells you all you need to know about what the mechanically identical Speed Twin will be like to live with, enjoying four and mainly five stars. Triumph gives you get bundles of style, performance, tech and quality parts for little money, but the Speed Twin is ever so slightly more expensive than the comparable BMW R nineT Pure and Kawasaki Z900RS. Street Twin owners who want a bit more oomph (ok, a lot more: 49% more power and 40% more torque) will love the new Speed Twin, as will Bonneville T120 riders who just want a bit more of everything and Thruxton owners who value their wrists. It also has enough power and joyful handling to keep all but the most speed-crazed sportsbike and super naked fans happy and relaxed on the road, too. 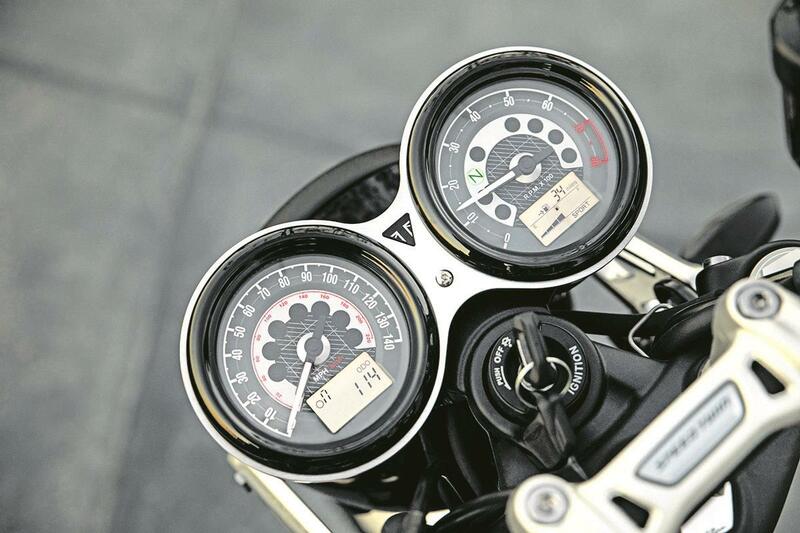 As we've come to expect from Triumph’s latest generation of retros, you get a lot of tasty spec for your money, including riding modes, traction control, ABS, a torque assist clutch, new clocks, LED lights, a USB charger, bar end mirrors, a Monza fuel cap and immobiliser, as well as over 80 Speed Twin specific accessories. 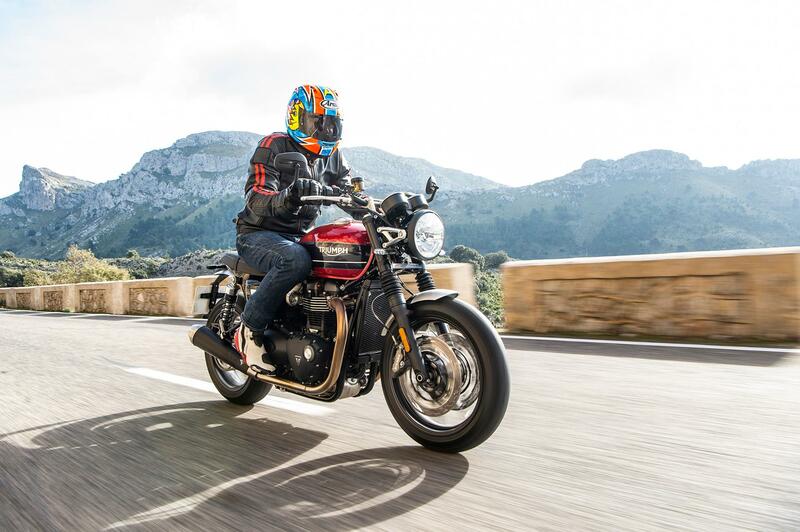 2019: Speed Twin launched with a Triumph Thruxton-based engine and chassis with roadster styling and riding position. 1 owner has reviewed their TRIUMPH SPEED TWIN 1200 (2019-on) and rated it in a number of areas. Read what they have to say and what they like and dislike about the bike below. A bike for town commutes, travelling and fun blasts. The bike is great around town on most roads and super on faster roads. Changing direction is soooo easy, as is leaning it over for fun. Both brakes are very good with plenty of feel front and rear. They scrape a score of 5 in my opinion, The suspension manages a 3, hence 4 average. I’ve done a couple of 100 - 150 mile trips (up to 75 mph plus:) ) and the comfort is good - seat firm but OK, riding position excellent, no buffeting, 60 year old wrists and neck have no issues. Controls are easy to use. Reports of slightly snatchy road and race modes worried me a little, but I now use race mode around town with no reason to worry. I’ve had four previous Triumphs - Tiger Sport, T120 Black, Street Triple 675, Sprint ST - and done some winter riding on all of them. The finish on this looks to be slightly better. No problem from the last few weeks of rain and slightly salty roads! Purchase price is at the upper end of what I felt able to pay, I’d give it 5/5 if the suspension was softer and I didn’t feel the need to upgrade it! Can’t complain about the 10,000 mile service interval. Dealer hourly rates are reasonable. It’s a modern Bonneville - ABS, traction control. The agile handling, low weight and smallish size for a 1200 form my favourite feature. It’s a great package. Handlebar and bar end mirrors are excellent. Mode button and electrics fall easily to hand. I use rain mode in the wet. I’ve used Triumphs own heated grips and their new 2in1 goretex gloves. These have worked much bettter than my two year old ( Ride magazine) winter warmth award winning gloves. I’ve ordered midrange adjustable KYB shocks (about £350) as I prefer a more compliant ride. Weslake cones are good value at under £300 and not too loud with the baffles in or out. I prefer the baffles in. These slipons are under half the price of Vance and Hines and a bit cruder to look at. My local Triumph dealer gave me a two test rides - the second to try some more rough town roads, so were very helpful. They also did a good deal on accessories, as the brand new Speed Twin launch meant discounts on the bike were hard for them to swallow. I saved a couple of hundred pounds through some small free accessories and some further free fitting of accessories I contributed to.